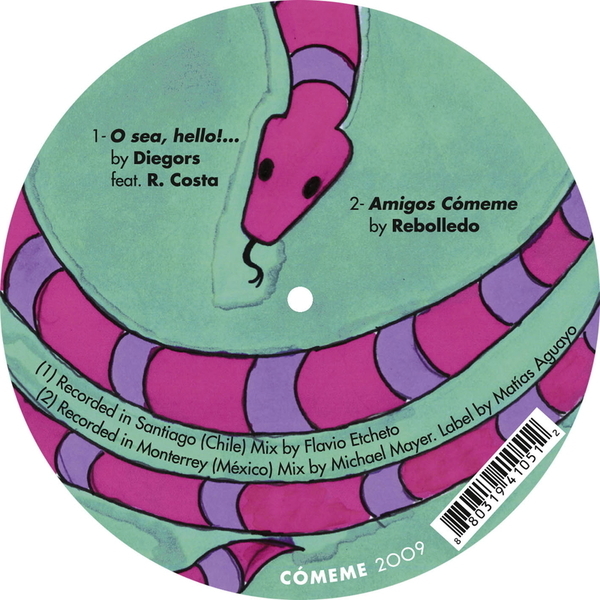 This second release from Matias Aguayo's Comeme label is a bit of a compilation EP, exhibiting a strong Latin American feel. Diegors' 'O Sea, Hello!' brings vibrant early-'80s funk into play, offset by a punchy, reggaeton-style rhythm, while Rebolledo's 'Amigos Comeme' contribution is a more brittle 4/4 workout (perhaps attributable in part to its Michael Mayer mixdown treatment). Next comes Aguayo's own 'Pata Pata' driven by an electro-tinged shuffle-funk only to be followed by the similarly primal, pared down 'Nuestro Ritual' by Petro, which attaches tribal rhythms to layered, mysterious vocal rumblings.